Dr Blood's Video Vault: I got my Netflix back! I got my Netflix back! It seems like I haven't written anything on this blog for ages not only due to the dearth of new horror movies but also because I put my Netflix account on hold for three months. 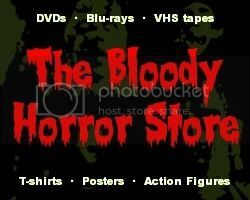 I'd watched 99.9% of the horror DVDs available through Netflix and, to be brutally honest, I was bored with it and somewhat pissed off that they still hadn't made it possible to watch the streaming movies on Linux or older Apple PPC computers. I still also have an old Pentium 4 laptop which I was using for Ubuntu 10.10 but I decided to wipe it and reinstall Windows XP on it just to watch Netflix. It's annoying that I had to do it especially as those Roku boxes which Netflix promote are Linux based. But, anyway, it's done now and I've been watching all sorts of things again not just horror movies. In the last week, I have seen "Don't Look Back" (with Monica Bellucci and Sophie Marceau), "The Assassin Next Door", "Lost Boys: The Thirst", "The Haunting of Molly Hartley" (even though I turned it off after the only pretty girl, Jessica Lowndes, got killed off five minutes in), "Wilderness" (the one about the borstal boys not the werewolf one), "Dorian Gray", "Blood and Roses", "From Within", "Vampyres" (1975) and "Horsemen". Of course I've been watching a lot of other crap too such as old episodes of "Men Behaving Badly" (the British version obviously), "Jersey Shore" and a lot of foreign language films which I can't recommend to anyone including, "Ma Mere", "Daniel & Ana", and "Dogtooth". The unfortunate thing is that if I keep going at my normal rate then I'll end up watching every "new" film that Netflix has to offer within another month and will still not be writing many reviews of them. Suffice it to say that Netflix is both a blessing and a curse if you write a movie review blog. I've found myself watching ten minutes of something here and 5 minutes of something else there then abandoning films or falling asleep to them because they weren't worth the effort of watching all the way through. Before Netflix I'd watch everything in its entirety whether it was good, bad or somewhere inbetween. A couple of days ago, I saw the first ten minutes of "Amusement" then clicked it off because I was bored and watched almost two minutes of "Taintlight" because it was all that I could stand of that utter rubbish too. I skipped through Melissa Bacelar's "Skinned Alive" on fast forward (chapter by chapter) because I couldn't get into it and then ended up watching a big chunk of "Phone" (the 2004 Korean horror). How my viewing habits have changed! I really don't think that the "streaming media" idea is a good one if you really love films. When a real physical DVD arrives through the post, I tend to enjoy it far more. I just started watching "Cracker" (the ITV one, season two) and the final episode should arrive today. I don't mind the wait for the DVDs as it gives me something to look forward to in the mail box other than bills. It's like a little present to myself every couple of days. One positive thing about the streaming films though is that I've probably saved a ton of money not blind buying DVDs from the local "Swap Shop". The obvious knock-on effect though is that if everybody does the same thing, there probably won't even be DVDs to buy anywhere in a few years time because all the DVD sellers will be out of business. Do you have Netflix? How do you use it? Do you prefer DVDs or watching movies online? Let me know in the comments below.